Don't mess with a Midwesterner's tart cherry pie! This one is made the right way—with a from-scratch PHILADELPHIA Cream Cheese crust. Drain cherries, reserving 1 cup liquid. Mix 1 cup sugar and cornstarch in medium saucepan. Add cherries and reserved liquid; stir. Cook on medium-high heat 12 min. or until mixture comes to boil; cook until thickened, stirring constantly. Cook and stir 1 min. ; cool completely. Stir in extract. Heat oven to 375ºF. Beat cream cheese and butter in large bowl with mixer until blended. Gradually add flour, mixing well after each addition. (Dough will be crumbly.) Shape into 2 balls; flatten slightly. Roll out half the dough on floured surface to 11-inch circle; place in 9-inch pie plate. Fill with cherry mixture. Roll out remaining dough to 11-inch circle; cut into 10 (1/2-inch-wide) strips. Reserve remaining dough for garnish. Weave strips over filling to make lattice design. (See tip.) Fold edge of bottom crust over ends of strips. Cut remaining dough into shapes with small cookie cutters; arrange on pie. Sprinkle with remaining sugar. Bake 35 to 40 min. or until filling is hot and bubbly and crust is golden brown. Prepare and fill bottom crust as directed. 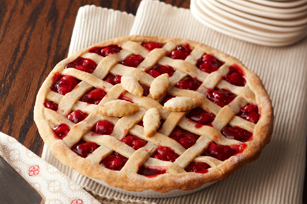 Cut second pie crust into 10 (1/2-inch-wide) strips with pastry wheel or sharp knife. Place 5 of the strips over filling. Weave lattice crust with remaining strips by folding back alternate strips as each cross strip is added. Fold trimmed edge of bottom crust over ends of strips. Seal and flute edge. Bake as directed. Substitute 3-1/2 cups fresh, or thawed frozen, tart cherries for the canned cherries. Pit cherries; place in colander over bowl. Drain, reserving juice. Add enough water to reserved juice to measure 1 cup. Use to prepare filling as directed.